I have come to the conclusion that I am not good about blogging in the summer. Apparently, I need to get myself more organized and blog the night before so posts are ready to go in the morning. So, starting next week, I’m hoping to be back on a more regular schedule and do just that! 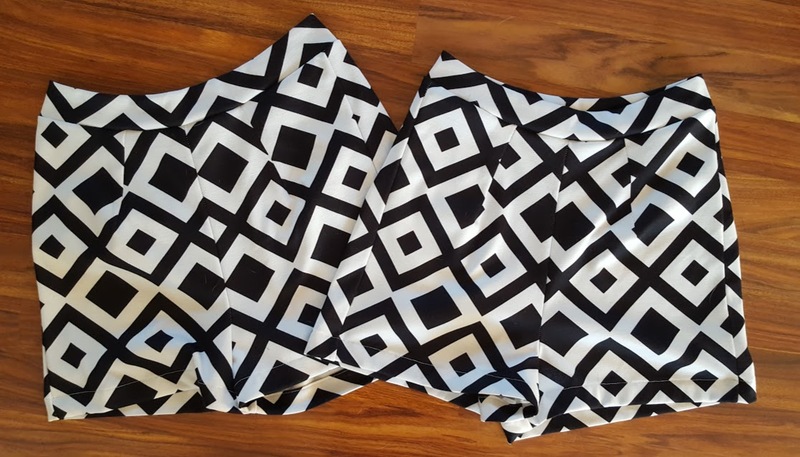 Somehow I managed to eeek out 2 pairs of shorts from 1 yard of fabric (the pattern matching looks much better with the first pair, though) – only because I made my first pair without pockets and used the thinner waistband. But what I’m sure you’re most interested in is how did they sew up. This was a surprisingly easy pattern to sew and went together quickly. The fit was great for both of us too, especially in the thigh area (which I was afraid would be too tight because we both have thicker thighs)…. I am guessing that most people will have good results because they are made with a stretch, though. I also like that these shorts are higher waisted as well – it definitely makes for a more flattering pant – the downside? You will probably want a more fitting top to go with it. Consequently, I am thinking of making a bodysuit to go with this one… I am super hesitant to do this because I haven’t worn one since I was in college and ugh, who wants to see me in that? However, I have seen lots of people with that combination and it looks great so I may break down and do it….. if I chicken out, I have decided that I’ll make the Cross my Heart Cami instead….. or do both. Either way, look for final fit photos once I am done! This entry was posted in Uncategorized on June 30, 2017 by stacy.